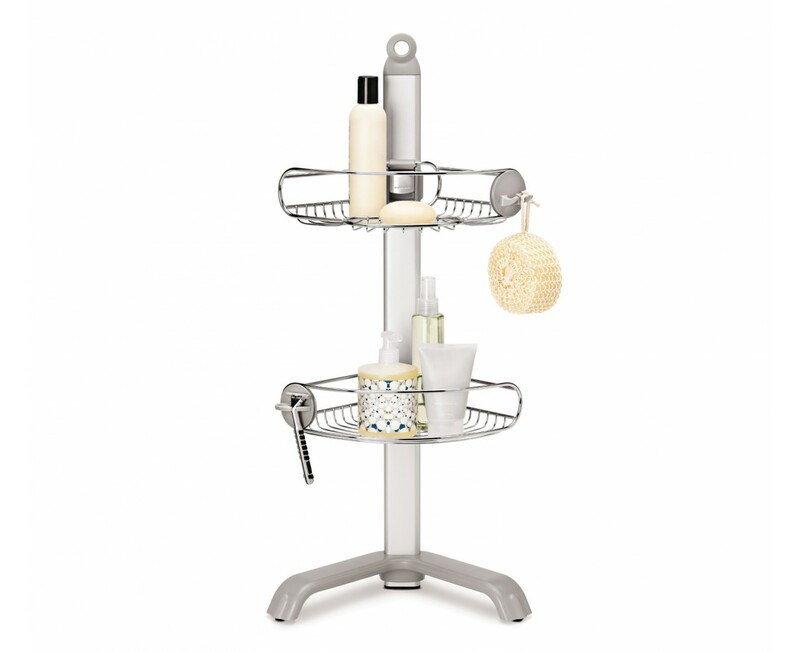 Our corrosion-resistant corner shower caddy maximises your storage space in corners. 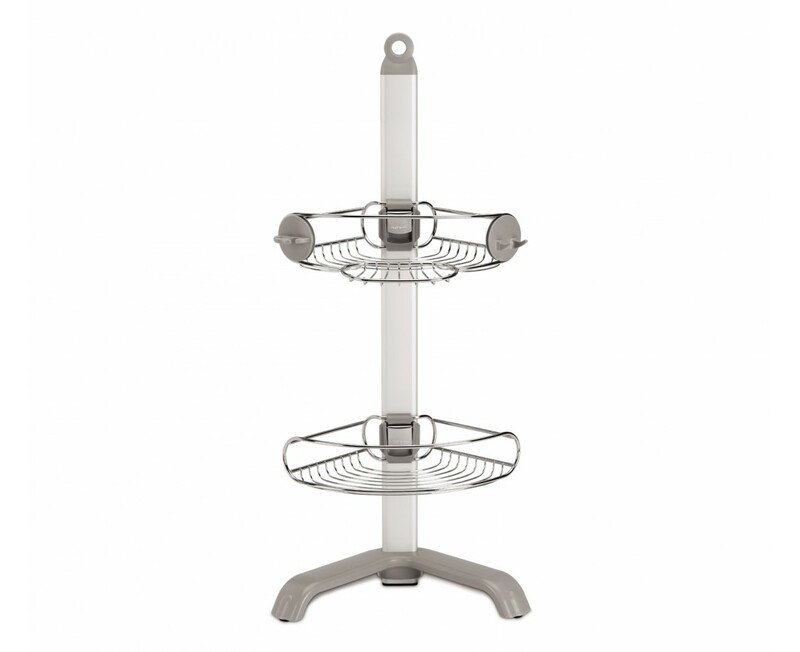 It has adjustable wire-frame shelves that slide up and down a reinforced aluminium pole. And together with a soap dish, a toothbrush/razor holder and two hooks to hang a sponge or washcloth, these shelves hold all your shower essentials. Its adjustable pronged feet ensure the caddy will be stable – even on uneven floors. A reinforced aluminium pole supports the caddy and helps keep it steady. Adjustable feet ensure stability — even on uneven floors. The answer to my prayers.After years and years of buying inferior caddies,this is perfect.Not only looks great,does exactly what it states,doesn’t rust.So pleased l bought another. Love this item. Fits perfectly on the edge of my new shower tray without needing any fixing. I have a window on the wall where it sits and it fits perfectly without interfering with the blind when down. Holds all items tall and short and matches my new shower. Would recommend. It is excellent - lightweight, unobtrusive and fits nicely in a corner. I like the ability to adjust the shelves and it is easy to keep clean. It has solved my problem. J'aime beaucoup le support à douche Simple Human. Par contre, il serait intéressant de le fabriquer plus haut soit d'environ 6 pouces. Il est discret dans la douche et les deux paniers capables de stocker une grande quanttié de bouteilles et autres accessoires. Reste à voir si le produits tiendra la route contre la rouille. love it! keeps everything nice very sturdy, wort the money! We have had our shower completely refurbished and wanted to find a caddy which would be unobtrusive, practical, very durable and well designed. We use it daily and it is perfect for our needs holding everything we might need with space to spare. The shower floor slopes slightly and so the adjustable feet are an excellent device. I had read a review which said it was too low but we are of average size and fitness and find it very easy to use. It is not cheap but is extremely well constructed and we found nothing else like it on the market. We expect it to look good for years to come. The only worry is possible mildew built-up on the bottom part of the stand. Also, the shelfing areas could be a little larger. Still need a hanging one. Set it up, adjust the legs and shelves, load it! Simple and it works great! This really organized my shower and sits perfectly on my shower seat in the corner. I love the adjustable shelves. The size is great, looks great, feels durable, and has great hooks for wash cloths etc. This is just what I needed for the guest shower! It looks nice and holds everything that you might need when you are in the shower. It stays put with the grips on the bottom and they are plastic so they won't rust. I liked the fact the shelves are adjustable so you can put those large bottles in without them falling over. I have a different type in my master shower and if it ever fails I will be buying another of these for my own use. This was my first purchase from Simple Human. The product arrived in good time (about a week). The quality was superior. I purchased it for my 80 year old mother. I ended up needing to return the item since it blocked my mother's egress. She enters her shower much different than I would. Simple Human was totally excellent with the return. I will shop them again and again for their superior quality and superior customer service. This is an attractive, sturdy product. Only wish it was a little taller. Very well made and the size is perfect for even a small shower. It is compact but not too small. It has adjustable feet to level it anywhere. We have not had it long so the jury is out on whether it will rust. This is a really great shower caddy. It's a good size (doesn't take up too much of the shower), and I like the fact that you can move the shelves up and down to accommodate bottles of different sizes. My one concern with the caddy is that it's not that easy to get some razors in and out of the spot the caddy has for them -- on the other hand, there's enough room on the top shelf that I just toss my razor there. It provides the space in an extremely neat and decorative manner! Fits beautifully on the shower seat in the corner. Is out of the way, very easy to move if necessary. Love it! My husband and I were looking for a shower caddy to accomodate our 10' ceilings. Since we couldn't find one, we were able to compromise with a floor caddy - the caddy fits nicely in the corner and holds everything! Don't waste your money...because you won't get it all back when you try to return it. The feet are too big to sit on the corner of several bathtubs that I tried, and there's nothing to hold it down, so even if it did fit it wouldn't stay upright. It's poorly designed. It's also not practical in the shower because you would have to bend very far down to reach it. I was very disappointed, particularly since I had to pay return shipping. I did subsequently purchase the shower caddy on a spring loaded pole and that worked fine. The shower caddy looks great and works great. its exactly what i wanted in a shower caddy! The Simple Human Shower Caddy is a great value. It is sturdy, adjustable, portable, and convenient. The shower caddy is perfect for my new shower room and as we spent a lot on it we wanted a classy looking product. The shower caddy is a good size, well made and looks good. Great product,looks and feels much sturdier than anything I've seen in shops.My only critisism would be the price. After several failed freestanding products, i.e. not strong enough, kept falling over, this one has been by far the best, it is neat and fits nicely into my shower space and easy to clean under and around. Would get 5 stars but is a bit pricey for what it essentially is, but would recommend it to others if they felt that it was justifiable to spend that much on a shampoo holder! I love that I can adjust the height of the shelves according to the height of my bath products. I also love that it has a soap dish attached to it. A great alternative to wire shelves hanging on the showerhead. The caddy doesn't take up much space and holds everything we need. Another terrific simplehuman product. This item looks great,very well made and looks superior to a chrome one I purchased before.I ended up taking that one to the dump after 4 weeks as it rusted from it's very first use. As this item carries a 5 year rust warranty I only hope it stays the course. Love it! 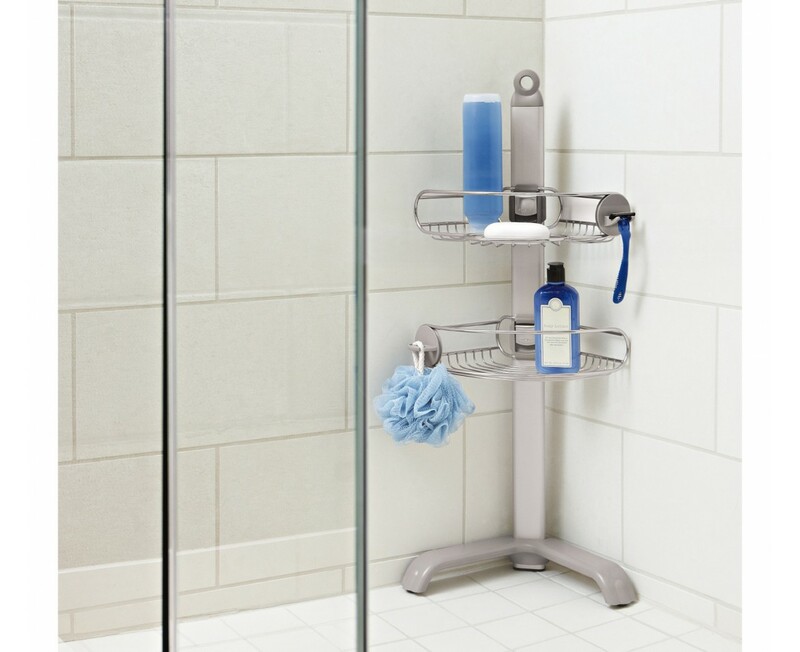 We found this Corner Shower Caddie at SimpleHuman on the internetand thought it was exactly what we were looking for. We have just had a new walk in shower fitted and didn't want to drill the tiles. The shower caddie fits beautifully and has enough room for all shower items and looks good to. Highly recommended. This shower caddy is EXACTLY what I wanted. Works great in my shower. Holds everything I need and then some. Sits there in the corner and looks as efficient as it is. The durability is excellent (all it does is sit there and hold my stuff, doesn't run around the room or hide or bother the other things in the bathroom). I heartily recommend this product. Oh, and it arrived faster than I expected. Item is excellent quality, but is very big so may not fit on your bath / shower side, as in our case. This is the second simplehuman item I have bought, the first being a kitchen bin. Both are good reliable well made items. And simplehuman provide the best after sales service I have ever experienced. We have just finished remodeling our bathroom, and the centerpiece is a beautiful, Egyptian glass tile large shower in all the shades of watery blue.We did not want to mar the effect of the gorgeous tile walls (which look like a waterfall) with shower shelves on the wall. This tower looks great and functions even better!